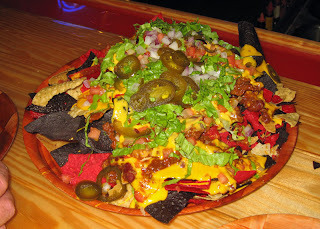 My blog is a culinary journey through good eats in central Florida and points beyond by me, the Lake Mary Food Critic. I cover all aspects of food including dining, cooking, shopping, and events--anything food! They claim to have the best breakfast in town, and you know, they might just be right! My friend and I decided to give Mike's Galley a try on a recent Sunday morning based on the good reviews on Urbanspoon.com. We were not disappointed. When we walked in around 11, they were pretty busy. But as luck would have it, someone was just leaving a table, so we snatched it up, even though it was dirty. But by the time we got close the dishes had disappeared, and within second one of the waitresses was cleaning the table. Wow, what service. We immediately had our beverage order taken. As a matter of fact, they tried to take it twice as another waiter also came by to take it. I will say that during most of our visit, we were double and triple teamed by the waitstaff: our drinks were topped off often and we lacked for nothing at all. The atmosphere here is somewhat diner-like and it fits it well. On walking in you're greeted by a "seat yourself" sign. The kitchen takes up about 1/4 of the square area, with tables and chairs aplently. The walls are somewhat kitch-ish, adding to the charm. It's a warm and comfortable atmosphere, for sure. After a short wait, our orders arrived. I ordered a half order of Sausage Gravy and Biscuits to go along with my Mike's Ultimate Mix. I think a better name would be "Mike's Mess," but that is a compliment. It was a huge plate full of food, 3 eggs scrambled with cheese. ham, sausage, bacon, mushrooms, onions, and tomatoes. It was absolutely delicious, fantastic. The sausage was big chunks. The ham was big chunks, This was very, very good. I had an English muffin with it and a Potato Pancake with onion. Both were also very good. 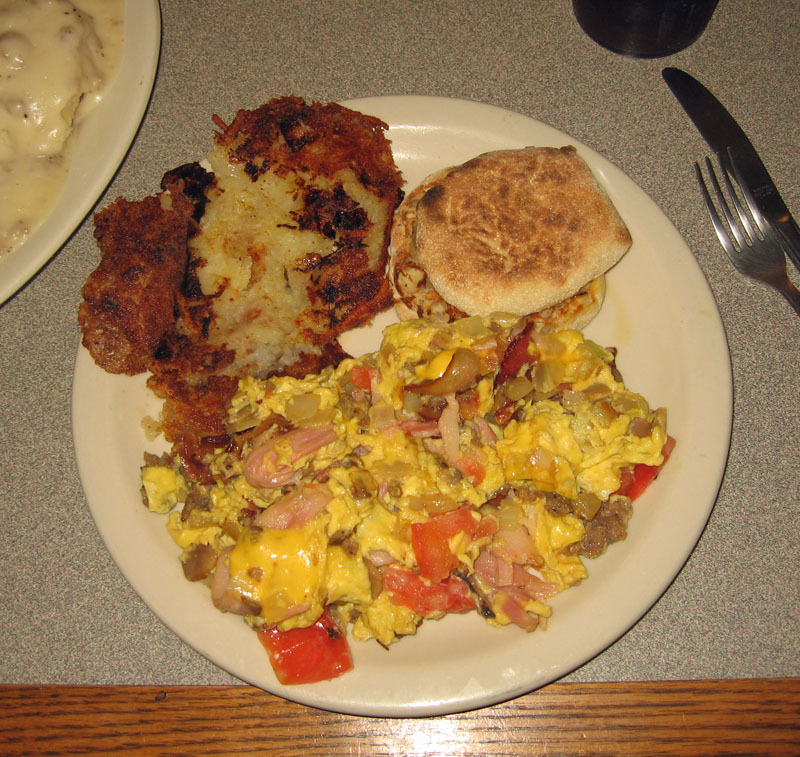 Now in all honesty, the Mike's Mix alone was more than enough, but I also had a side of Biscuits and Gravy. That was pretty good too, though just a bit on the salty side. I could not finish it, no way! It was all very good. 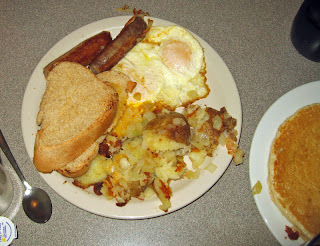 My friend Tommy ordered the 2 eggs over medium with toast and home fries and sausage. It was also very good, though he did note that the over medium eggs had a bit of runny whites in them. But they were good. The toast appeared to be of homemade bread and was very good. The homefries, he said, were just OK. The sausage links were huge, and very good. Overall, this was a very good meal, and I'd say yes, it was the best breakfast in South Daytona Shores, no doubt. I'd come back here again for breakfast. The food was good, the service excellent, and the value outstanding. Yumm! We stopped at R.G. Brewski's for dinner the other night and had a very nice meal. We walked in to a very busy place. It's a sport bar and has that atmosphere with TVs and games going all over the place. A bit on the noisy side, too, but that's to be expected. We were told there would be about a 20 minute wait, which was fine. We found a few seats at the bar and had a beer. They have 20-something beers on tap, which i really liked. Eventually we were seated. They were busy and the Orlando Magic game was on most of the TVs, and lots of fans eating and watching. Our waitress was very prompt and, since we'd already looked at the menu while at the bar, we went ahead and ordered some appetizers. We started with two appetizers. The first was the "Pierogies" (bad Polish grammar since the word pierogi is already plural, but I guess it's "anglicized"). Yes, they had pierogi on their menu. I like that. 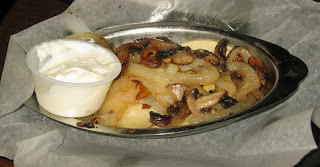 They served potato and cheese pierogi, three of them, and they had been fried in some onions and mushrooms. They were all a pierogi should be, though the actual pierogi themselves appeared equivalent to store-bought "Mrs. T's"--nothing too special, but still good. And when you dress them up with the mushrooms and onion, you really do elevate them to a new level. They were served with a side of sour cream, though with the mushrooms and onions, they didn't even need that. Very good. Bardzo smaczne! 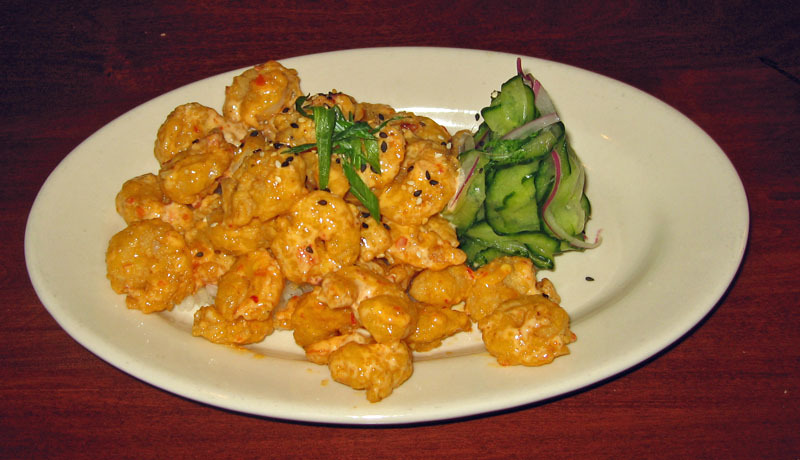 Next up was the Asian Fiery Shrimp appetizer. I thought these to be very, very good. Ranking right up there with a few other spicy shrimp appetizers I've had at other places. The shrimp were nicely deep fried, then covered with a fairly spicy dressing. I'm not exactly sure what made it "asian" but it sure was good. There was a side of blue cheese dressing as well, to help tone down the heat. I thought these were very good with a fair amount of heat. My friend Tommy found them a bit on the hot side, but he ate and enjoyed them nonetheless. These are a real hit. For my main dinner I had a burger. Specifically, the BBQ Bacon & Cheddar Burger. It's what I call affectionately a "garbage burger" because there are so many topping on it. But it was good, if a bit messy to eat. It was topped with jalapenos and onion rings as well as a bit of lettuce, tomato, and pickle. A lot to eat! There was what I consider one little misstep, though, and that was the single leaf of lettuce--it was half good, but half of it was severely wilted, like it had been too close to the heat. It looked "odd" and off-color. I would not have served that particular piece of lettuce, as it stood out like a sort thumb on an otherwise nice lookign burger. But that's a small point, granted. 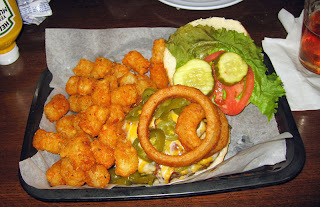 The burger was served with Cajun Tater Tots, also a hit, though nothing out of the ordinary. I enjoyed my burger. It was a bit hard and messy to eat, but I knew that up front. Still it was good and was cooked to the requested medium. Yumm! 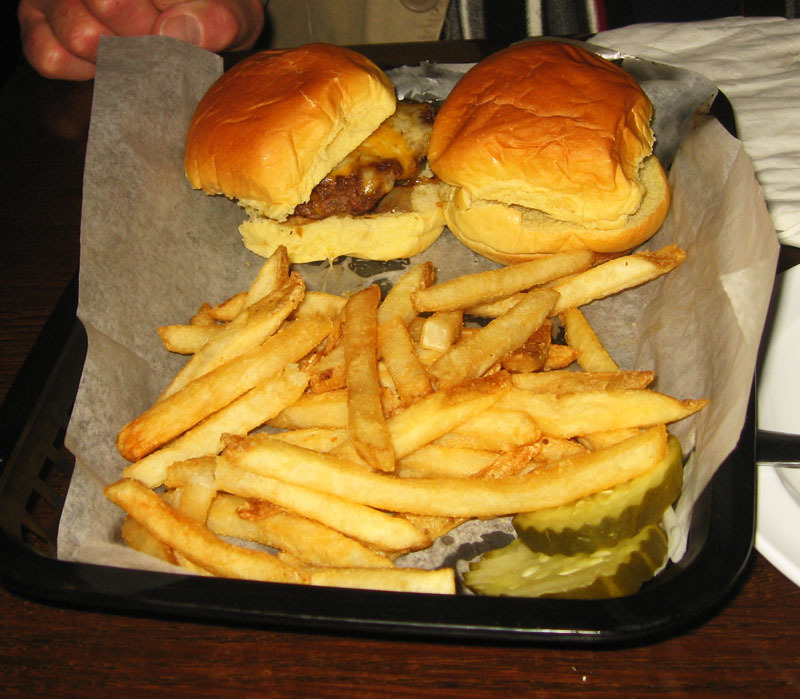 My friend Tommy had the Mini Cheeseburgers & Fries (an item on the appetizer menu) for his main dish--basically, sliders. It was very good and he liked it a lot. The fries were nice and hot, very good fries and I had quite a few of them. We had a nice meal here and a positive experience. Our waitress, Jackie, was very busy but took good care of us and we didn't lack a thing we needed. It got a bit loud later as they turned on the sound for the Magic Game, but that's what I'd expect in a sport bar, so it is not a complaint. We enjoyed our experience here. This is one of the best sports bars I've been in, and I'd go back again to eat here, the food was good and a fair value. Definitely Good Eats! My friend and I made a return visit here the other night and had a nice meal. We'd been to Maria Bonita Restaurant Mexicano before and had to wait. This time luck was with us and there was no wait, though they were generally busy. We were quickly greeted and shown to a table, and in short order our waiter, Josue, took our drink orders. He returned with our drinks and also some chips and salsa. The chips were nice and fresh as was the salsa, very tasty. For my dinner I ordered the Guadalajara, a combination dinner which consisted of a chicken enchilada, a chicken burrito, and a chicken tostada. All were delicious, but the chicken tostada really stood out in my mind, it was excellent, absolutely wonderful. The other components were very good as well. It was served with some refried beans and rice and a bit of guacamole and sour cream as well. Not only was it very good, but it was a lot of food as well. However, somehow I managed to eat it all. My friend Tommy ordered the Steak Fajitas, the normal steak and onions and bell pepper served hot on a sizzling platter with flour tortillas and beans and rice as a side (with a bit of guacamole, salsa, and sour cream). Tommy was not overly impressed with them, saying they were good, but certainly not the best he'd ever had. I had a taste and I'd agree. 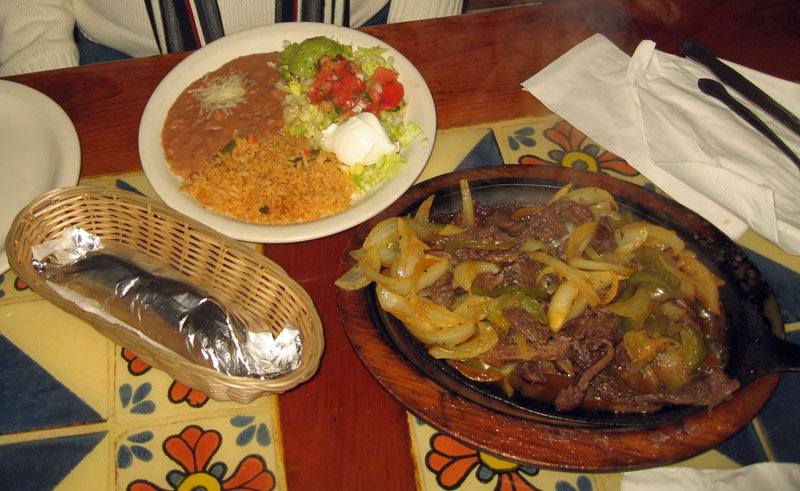 For some reason, the fajita meat seemed a bit too sweet for my taste. It was not bad, just not great. Our service during the meal was OK, but just OK, it could have been a bit more attentive. Several times someone who I guess was the manager came around and basically asked if things were OK, but that was about it. Our meal was prompt as was the check, though. So it was OK. Overall it was a good meal though I've eaten here before and it was a bit better. 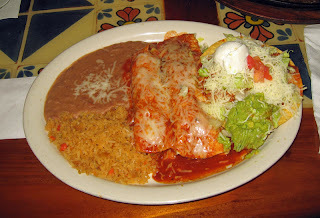 Still, it's not bad Mexican food considering, and certainly better than you get at a chain such as Don Pablo's. I'll eat here again, it's a charming place with good food at a reasonable price. You get what you pay for at Cracker Barrel. It's just good "home cooking" type of food, reasonably fast with good service and a decent price. Consistency is key too. There are many Cracker Barrels all over and you can be pretty sure that they'll all be the same. My friend Tommy and I, longing for just some simple comfort food, ate at Cracker Barrel in Sanford recently. We had good service, good food, and at a good price, in a warm atmosphere. No complaints, we got what we paid for. 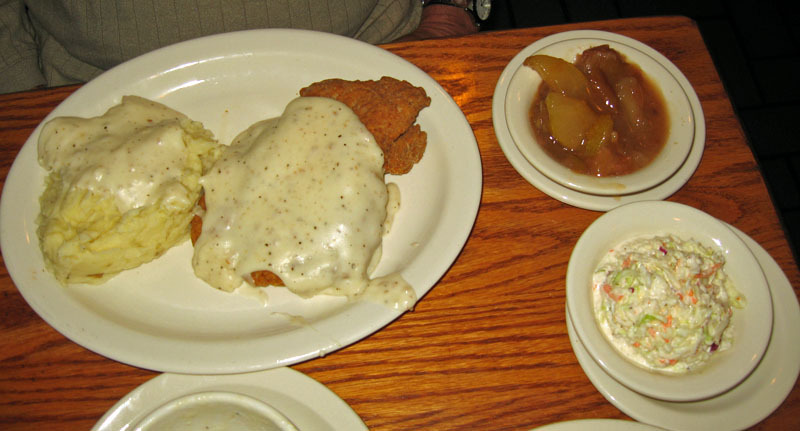 Tommy ordered the Chicken-Fried Steak--how can you go wrong with something like that covered in country gravy, served with mashed potatoes, baked apples and coleslaw. It was just plain old good. Not to fancy, not gourmet, just good old stick-to-your-ribs food. 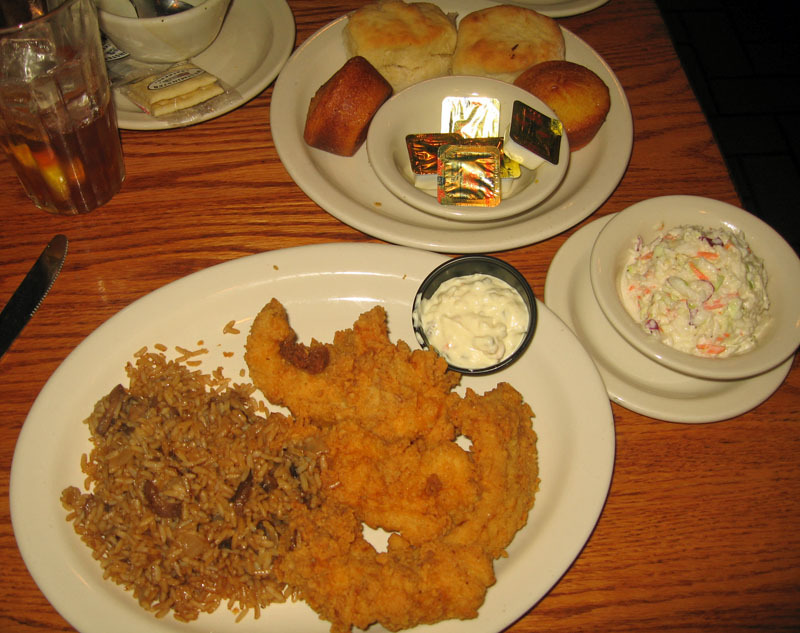 I had Fried Catfish served with rice pilaf and coleslaw. Of course tartar sauce as well. It was good. Our meals also came with biscuits and cornbread muffins. We had good food, a nice atmosphere, and friendly service. What more could we ask for? And, it was a value. 'Nuff said! Manzano's is pearl, a small, family run sandwich shop in the heart of downtown Deland. I had been past it a number of times and kept telling myself I needed to eat here. I was right. Normally they are only open mornings and afternoons and closed Sundays. But the Deland Fall Arts and Crafts Festival was going on and so they were atypically open on a Sunday. It was my lucky day! After we placed our orders, we sat grabbed a table outside. They assured us they'd find us, and they sure did, no problem. 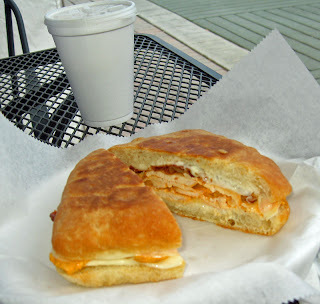 I ordered a hot buffalo chicken sandwich, served on a type of ciabatta, I believe. It was very good. The bread was exceptional, very fresh, a nice bit of a crust, and quite tasty. The chicken in the sandwich was sliced thickly and nice and tender. For my money, I could have taken a bit more heat, but it was a fine sandwich, very, very good. The sides were served in small coffee cups with lids. We both had the potato salad and it was outstanding. 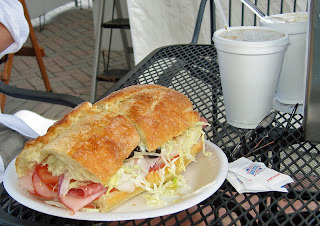 My friend Tommy had an Italian Meat sandwich, and he said his was also aswesome. It was a huge sandwich served on a nice, firm french type of bread. Again, it was quite a hit as were the sides. As a matter of fact, both of us only were able to eat half our sandwiches and half our sides, so we had another great meal from Manzano's later. This place is a real gem. If I lived nearby, I'd be here all the time, I highly recommend them. The service also bears mentioning because it was very good. A few times the father of the owners (who was there "helping out" as families do) stopped by to check on us and to chat and made sure we had to-go boxes and all. This was a very pleasant experience from start to finish. It's a small place, but with a huge taste! 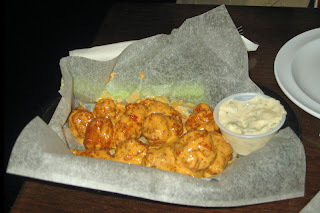 You get what you pay for, and we had a decent experience at Wing House of Daytona Beach. We were downtown to attend the Elton John and Leon Russell concert at the Ocean Center. The downtown and boardwalk area were quite busy. After trying a few places and not wanting a long wait, we settled for the bar a the Wing House. It was a good decision. The bartender was very attentive, our food was not too long in the making, and it was pretty good for the price. We started with the nachos. Oh my! This was a huge plate of nachos, but we did do a good job on them. Nachos covered with taco meat, some beans, cheese, jalapenos, lettcuce and some onions. They were served with a bit of salsa and some sour cream and were really good, all that nachos should be. We pretty well cleaned them up, to be honest. Wow. For "dinner" we decided to spit a fish sandwich, and that was a good choice since we were already pretty full from the nachos. The sandwich was good and decent, though nothing extraordinary. Still, it hit the spot and, with a bit of tartar sauce, was quite tasty. This is a very touristy area, so that is a drawback (for me). But for a quick bite and somewhat of a party atmosphere, I'd go back! 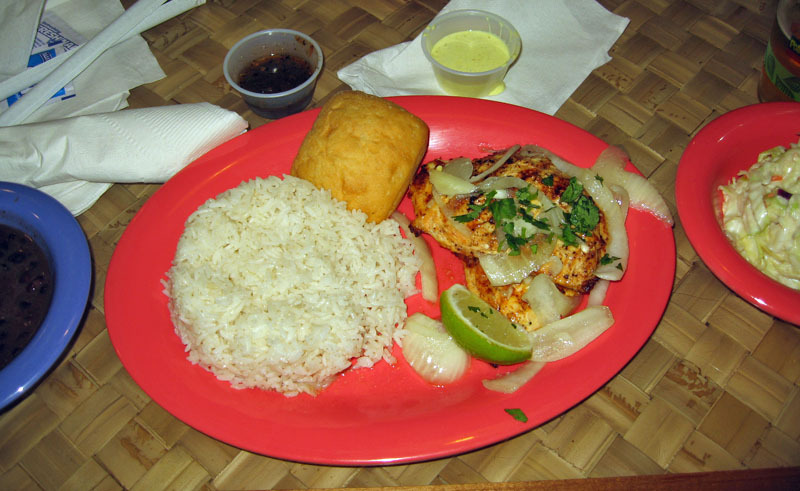 It may be "fast food," but I find Pollo Tropical to be healthier and better than many of the fast food joints around. My experience there the other night was another good experience. I have eaten at Pollo Tropical quite a few times in the past, but had never been to this location before, and went with my friend Tommy, who had not been to Pollo Tropical before. It was a winner of a visit. We went on a Friday evening. It was not extremely busy, but they seemed to have a steady line of people coming in and out. For my dinner I ordered the Boneless Breast of Chicken with two sided. For sides I had the Black Beans and Rice and also the Coleslaw. The meal was served with a roll, too. The chicken was very tender and juicy and very tasty, quite easy to cut. Of course how can you go wrong with black beans and rice, and it's quite nutritious as well. The coleslaw was equally good. I found the roll the most interesting item, because it had a slightly sweet flavor that took a second or two to identify--coconut! It was definitely unusual but was nice and added to the Carribean flavor of the menu. My friend Tommy had the Half Chicken with two sides, but for his sides he had the Mashed Potatoes with Gravy and a Ceasar Salad. The chicken was very tender, moist, and juicy, with a nice crispy skin--they grill their chicken here which helps with the crispy skin and keeps things on the healthy side. His only complaint was that the mashed potatoes could have been hotter. They were warm, but not overly hot. But they were delicious, including the little lumps that really made them seem homemade. We both enjoyed our meal here very much, and it was quite reasonable as well, a good value, and somewhat healthy. I'd go back again, for sure. We had a great lunch experience at Yabi Sushi the other day. About 8 of us from work went to Yabu Sushi on a busy Friday at lunch time. Note to self: go earlier (or later) next time, not right at noon. It was busy but we only waited a few minutes to have two tables put together. Their menu is huge, many different types of sushi with lots of variation. It took a bit for us to look over and understand the menu. Our waitress was very prompt, very efficient, and quite patient with us. Eventually I decided, and I started with a Spicy Krab and Seaweed Salad. It was very good. You may notice from the picture on the left that I dug right in even before I thought of taking a picture. Now, admittedly that's Krab with a "K," but that's OK, it was still very good. It was labelled as spicy but it was very tame spice, just a hint. Still, it was absolutely delicious, and finised off with a bit of sesame seed on the top, too. I ate every last bit of this! For my main dish I decided on the Caterpillar Sushi Roll. This was tempura-fried shrimp with avocado, eel sauce and white sauce. Perhaps even a bit of cream cheese. No matter, it was excellent. 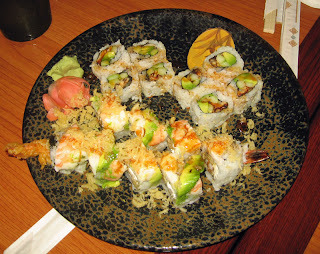 Now, I am no sushi expert, but i do know "good eats" when I have them, and this was good. Adding a bit of wasabi mixed with low sodium soy sauce and a bit of pickled ginger, this was very good, and a good sized portion for lunch. Could I have eaten another roll? Possibly, but then I would have been over stuffed. Between the eight of us, we had a wide variety of menu items from different types of sushi to other more "mainstream" menu items. Everyone was very happy with their food and we all remarked that the food was good, it was fresh, and it was pretty darned fast to arrive, given that the dining room was at capacity. Our server was aided at times by other servers or maybe runners, but everyone there seemed to work together well and very efficiently. I'd love to go back here some time with a group for dinner and maybe sample a variety of fresh sushi--there are an awful lot of very interesting items on the menu. Judging from the urbanspoon.com ratings and comments and our our experience, it's well worth another visit. Yumm! I am making my own recipe called Leon's Kick @$$ Chili for Alive After Five in Downtown Sanford on Thursday, January 13th. Alive after Five is a "second Tuesday of every month" street party held rain or shine from 5 PM to 8 PM on First Street in Sanford. The streets are blocked off and vendors set up along the street, giving out food samples. There is always a theme and this month's is Chili. There is actually a chili cook-off going on, though I don't have the time to devote to making that much food. Still, i will be serving my chili there at Art Affair Gallery, my usual hangout. This blog post is my recipe for all those who will stop by or who have stopped by if you're reading this afterwards. So, without further ado, here is how I made mine! 4 # Chuck Roast, cut into 1/4 inch (or so) dice. Bean: soak the beans in 6 quarts of water overnight. Drain and rinse slightly. But in a large pot and cover with fresh water, add a bit of salt a pinch or two. Bring to a boil and simmer 60-90 minutes (depending on the bean you may need to adjust) until you can easily squish one between your thumb and forefinger. When you can, they are done. Drain and set aside. Prepare the fresh chilies by roasting or charring on a grill, then let rest 15 minutes in a sealed bag. Pull off the skins, open and discard the seeds. Chop finely and set aside. Brown the chuck in batches with a few teaspoons of vegetable oil in a medium-hot saute pan or large stock pot. Do not crowd. When nicely browned, remove to a separate dish and hold. As you are browning the chuck, begin adding the spices, some to each batch. You can adjust the spice to your liking, but remember it's hard to remove too much heat. You can always add more later, but do season each batch. Once the chuck is all browned, set aside and cover. If your pan gets too much fond (the brown stuff), deglaze with a bit of the beer and add to the reserved meat. Add the onion and a pinch or two of salt. Deglaze with the rest of the beer and cook until the onion is soft. Once soft, add the minced garlic and cook only 30 to 60 seconds, until fragrant. Do not burn the garlic, you'll be sorry.... Add the ground beef and cook until well cooked, adding more spices as you go. Add the browned chuck and all the juices to the pot, then all the tomatoes and stir. Add the chile and the chipotles with adobo. Taste but be cautious about adding too much chile power. Bring to a boil then reduce the heat to a simmer. Once simmering, add the beans and stir gently, then add the brandy and finally the chocolate. By now you should have added all the ingredients. Taste and adjust the heat with more chili powder if desired (I went light on the heat for this recipe, though I prefer more). Just before serving, taste and add any more salt, if needed. Simmer the chili on low heat for 4 or more hours. Add a bit of beef broth if it gets too thick, or thin with some masa harina if it's too thin. It's actually better the second day and freezes well too. 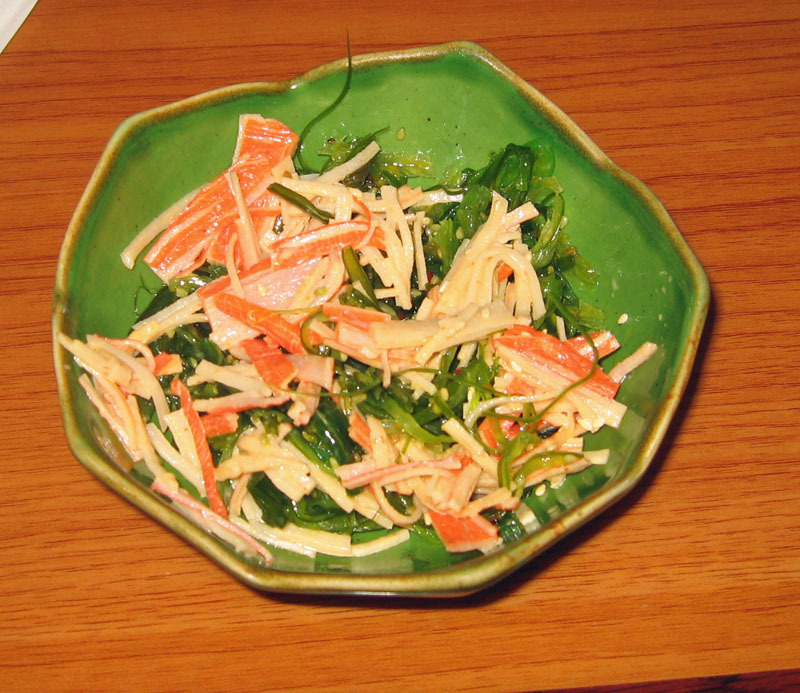 To server, you can add shredded cheddar cheese, a bit of sour cream, and/or some chopped scallions. Serve with some tortilla chips, too, and your favorite cold beverage. This recipe is definitely Good Eats. If you tried it, please leave a comment! I have to agree with Tasty Chomps, I thought I was in a scene from The Godfather. My friend Tommy and I stopped at Pizzeria Valdiano for a light early dinner on a recent Saturday evening. When we got there, it was not very busy, but by the time we left, there was a line out the door and we barely got up from our table before someone else claimed it. 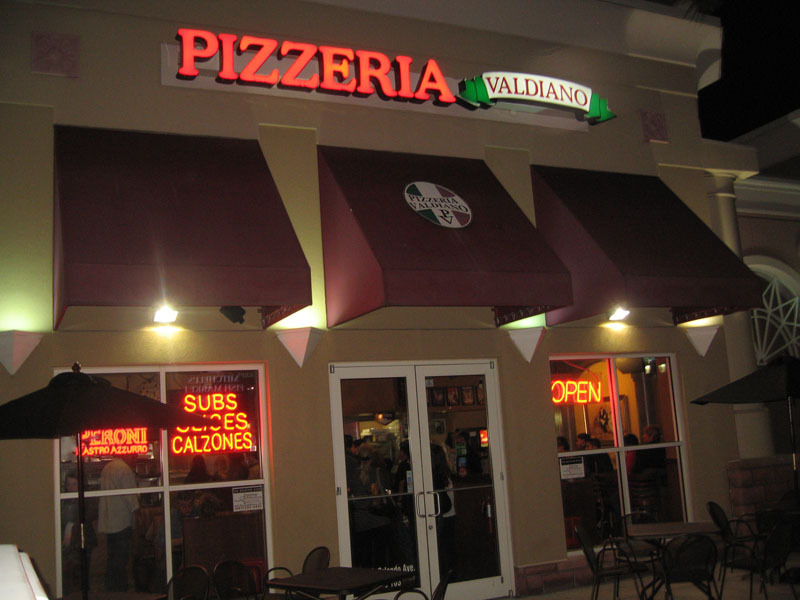 This particular Pizzeria Valdiano is located right next to the movie theater in Winter Park Village--an excellent location, it appears. It's not a very large place, but as soon as we entered, we were greeted by Tony Soprano (or someone a lot like him) from behind the counter. This man was definitely the "brains" of the business, greeting everyone, taking orders, keeping track of orders, keeping the help on track, and constantly, constantly making pizza. As we sat and ate, his hands never stopped making pizza dough--without even looking. And you know what, the pizza was very good. I had a non-traditional pizza, a Pizza Buffalo Chicken, and it was very good. 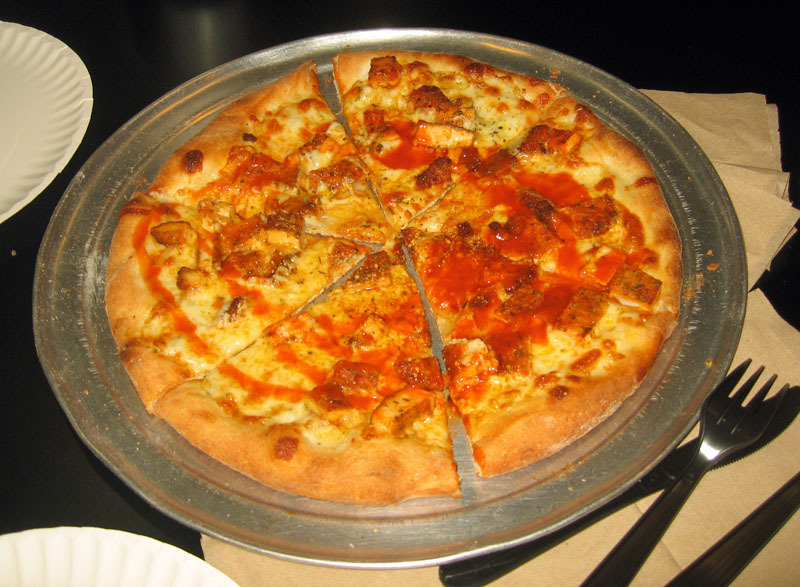 The pizza was mozzarella cheese, buffalo chicken, and gorgonzola cheese. After cooking it was finished with a spicy buffalo sauce. This was a hit. And I hate to admit it, but I ate the whole thing. The crust was nice and perfectly cooked. The buffalo chicken was nice and tender with just a bit of heat. The gorgonzola added that bit of "buffalo wing flavor" that it needed, and the finish of the spicy buffalo sauce upped the spicy quotient just a tad. It was not too spicy and you could still taste all the ingredients. Yumm, a definite thumbs up. 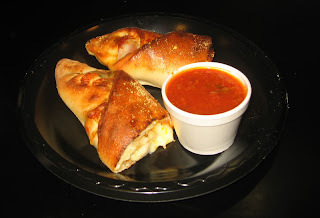 My friend Tommy had the Pepperoni Stromboli and it too was very good. It had a nice compliment of pepperoni and Cheese inside. The marinara that went with it was very, very good. As a matter of fact, I used some of it for my pizza crusts and even took a sip or two. It had a nice tomato flavor with some oregano, onion, and garlic. Not overpowering, just perfect. Pizzeria Valdiano has lots of great pizzas on their menu as well as other items. They sell a lot of pizza by the slice, it seems (helps to be next to a movie theater, I'm sure) as well as do take-out and, it seems, delivery as well. They were very busy cranking out pizza after pizza when we were there. I'd go back again. No wonder they keep winning the "best pizza" Foodie award. 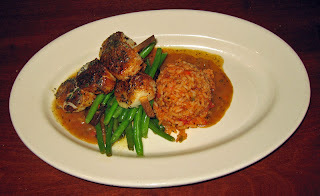 I had wanted to eat at Mitchell's Fish Market Seafood Restaurant & Bar for some time. When the opportunity arose recently, I took it and I am sure glad I did, I had a wonderful lunch here. I had received a gift certificate for Mitchell's from a friend for Christmas. I was off work New Year's Eve day, so my friend Tommy and I decided to try lunch here. We're glad we did as we had two very good meals with more than enough food. First, though, a word about our service--it was fantastic. Now in all honesty, we were there around 2 in the afternoon on a holiday weekend, so they were not all that busy. But no matter, Chris P. took excellent care of us, was great at explaining everything on the menu, and made sure we were well taken care of. We started out with an appetizer, the Spicy Asian Shrimp--true to it's name, the shrimp were covered in a nice and spicy/hot glaze. It was a nice heat, not "burn your mouth" hot but certainly a heat that you remembered for several minutes. The shrimp themselves were cooked perfectly, just perfect. They were served on a bed of sticky rice and accompanied by a little tower of pickled thinly sliced cucumbers with red onion. The cucumbers served as a nice and cooling counterpoint to the spiciness of the shrimp along with adding a great texture to the dish. This was a great appetizer. I and count on three fingers all the really great spicy shrimp appetizer's I've had recently, and this is one of them. I'd surely order it again. And the portion was very good, almost a meal in itself. 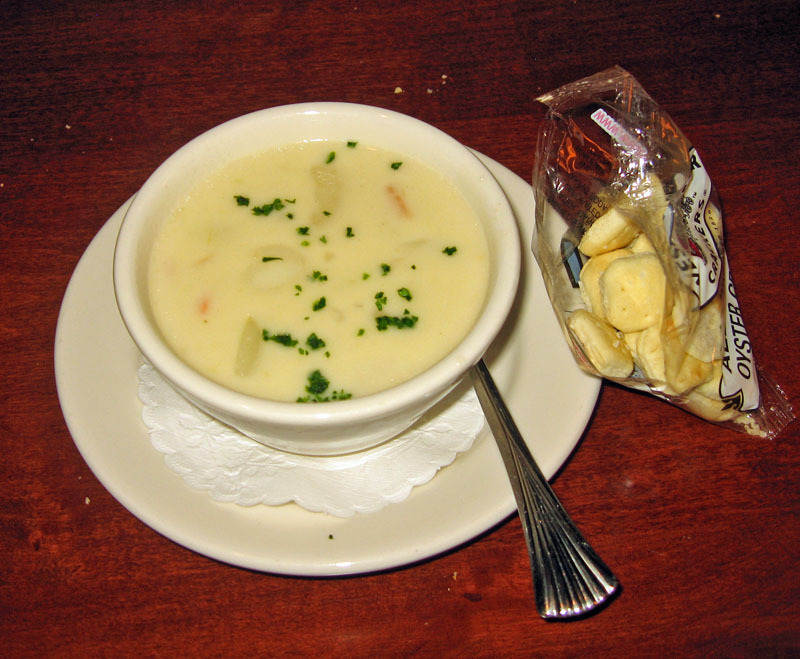 Tommy ordered a cup of the Little Neck Clam Chowder. It too was very tasty and creamy with nice chunks of potatoes and clam in it and a nice clam taste. And it was served with crackers--a must for Tommy. He did say it was good, but nothing extra special either, just good clam chower. But he did eat every last drop! I started with "The Market's Famous House Salad." Not sure how famous it is since I'd never heard of it before, but it was good. 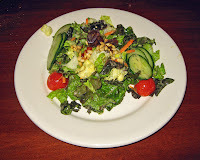 It had a mix of greens with carrots, cucumbers, cherry tomatoes, dates, and pine nuts and was topped with a poppy seed viniagrette. For my taste, it was a bit over-dressed, that is, too much dressing. But it was all very good and the dressing itself was very good. I liked the various tastes and textures with the creaminess of the pine nuts, the chewy sweetness of the dates, and the tangy dressing. And it was an ample size as well. Yumm. For his main course, Tommy chose the Scallops and had them Blackened. Now for his taste, he said there was a bit too much blackening, but he does not like to much spice. I had half of one and found them good. They were extremely tender and well cooked. Two skewers of three rather large scallops were served on a bed of jambalaya rice with etouffe sauce, shrimp and andoullie, and accompanied by green beans with mushrooms and a cane syrup. Everything was very good and quite an ample portion. Tommy even had a doggie bag to enjoy another time. So many things on the menu looked so good that it was hard to choose, but I finally settled on the Chef's Feature, a Sesame Seared Tuna--I chose to have it cooked medium--that was served with sushi rice, Kung Pao Broccoli, crispy wonton shreds, and wasabi. It was all exceedingly delicious. Now, next time I'd probably choose medium-rare to rare, but I was a bit timid. But the tuna was very moist and juicy, quite flavorful. Everything on the plate was excellent, actually. The wasabi was quite potent, the wontons added a nice crispiness to the dish, and the rice was very good I like this dish a lot--so much that I ate more than I should have and cleaned my plate--it was that good. If my first visit is any indication of the quality of food and service at Mitchell's, I'll certainly come back again. There were many other items on the menu that I'd like to try as well. The prices are a bit high unless you consider that you get what you pay for, and I'd say I did get what I paid for at Mitchell's an excellent meal in a nice atmosphere with great service. I'll be back! Eating, cooking, and fooding my way around Central Florida and wherever else I may wind up. I love to try new places and new things, got any suggestions?